It’s always nice to have some company over for some fun and entertainment, and it’s certain that your dog is going to enjoy the new attention. Old friends, new acquaintances, and maybe even a few other dogs add to the fun of an evening. But, having a few dogs visiting isn’t always as simple as it sounds. Each dog has their own personality and even their own habits- some of which may not be approved of by you or your dog. First consider how these new dogs will affect your dog’s behavior. Are the other dogs friendly with your dog? Do they have good social skills? Does your dog have good social skills? These are questions you must always ask yourself to ensure that everyone is going to get along just fine. Start with marking. This is possibly the most notorious example of visiting-dog situations to avoid. Dogs love to mark their territory, even the ones that have been fixed. In some situations, even females will mark territory. Regardless of whether your dog is accustomed to marking, if others mark in their home, they’ll likely do the same. This can sometimes lead to disagreements between dogs. Be cautious of dogs that show any signs of aggression, such as growling or fixating on a single dog (staring without moving). Be ready to separate them before anything starts. Prearrange separate areas where they can stay if need be. What about plain and simple confusion? A visiting dog isn’t necessarily house trained, and they may decide to go potty on your carpet. The scent is there, and it’s likely that your dog is going to want to use the same spot as well. Always keep enzyme cleaners readily on hand. If one dog uses a spot, clean it quickly before any other dog decides it’s a good idea to do the same. 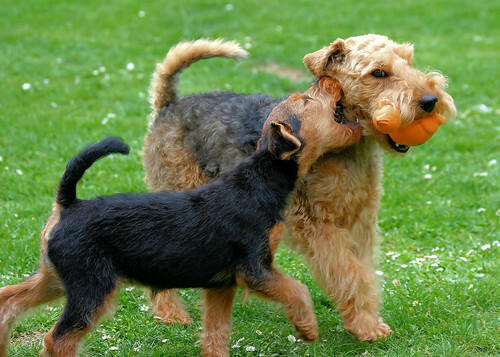 Designate an area where your dog and visiting dogs can play together. Even if your dog is allowed to roam the house the rest of the time, limit everyone’s space to help ensure control over the group. Having a few dogs over to visit should be a fun experience for you and your dog, not a burden or a hassle. As long as you take a few precautions and keep an eye on what they’re doing, everyone will be able to enjoy a good time hanging out with their dogs.